Paul has been talking about our new life in Jesus Christ. He refers to our not being with Christ but, far more intimately, ‘in Christ.’ This expression and variations on it occur 164 times in his letters. Paul now reveals that a part of his prayers is that God will “give you the Spirit of wisdom and revelation, so that you may know him better.” This immediately gives us the insight that it should be a part of our own prayers as well. Note that he is not praying that we will know more about God – as in the accumulation of knowledge – but that we will get to know Him more and more as the Person that He is and in so doing deepen our relationship with Him as well as our knowledge of Him. Adolphe Monod wrote that “Philosophy taking man for its centre says know thyself; only the inspired word which proceeds from God has been able to say know God.” That is both our calling and God’s desire for us. He wishes us to have and to enjoy a personal and deepening relationship with Him – both now and throughout eternity. And it is only through coming to know God as our Creator and Redeemer that we have any possibility of really coming to know ourselves – both as we are and as He intends us to be. Ask the Lord to reveal Himself to you – and look out for Him in His Word and in your prayer life and living. 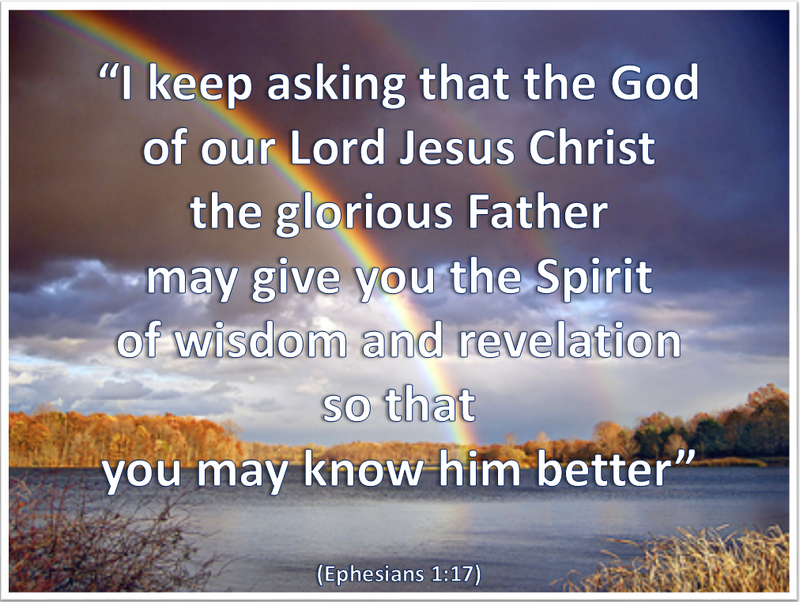 Father God, please bless me with Your Spirit of wisdom and revelation so that I may know You better. And please help me to be aware of Your reaching out to me, to recognise it and treasure it, as You draw me into a more meaningful relationship with you. Amen. Categories: Christianity, Daily Life, God | Tags: Daily Bread, Ephesians, Jesus, Life, Love, Priorities, Scripture | Permalink.